I have been using Proactiv for a few weeks now and today I am going to share with you a little of my Proactiv journey. But first, do you remember my first Proactiv post? I talked about scents and my sensitive skin? Well, feel free to read this post to learn a little more about my skin and my first impressions of Proactiv, click HERE. Now let's talk about Proactiv. This 3-Step System gently cleanses and exfoliates while attacking acne-causing bacteria in the pores and helping to soothe inflammation. Formulated with exclusive micro crystal benzoyl peroxide, the 3-Step System is designed to allow the key active acne-fighting ingredient to absorb quickly into the pores. 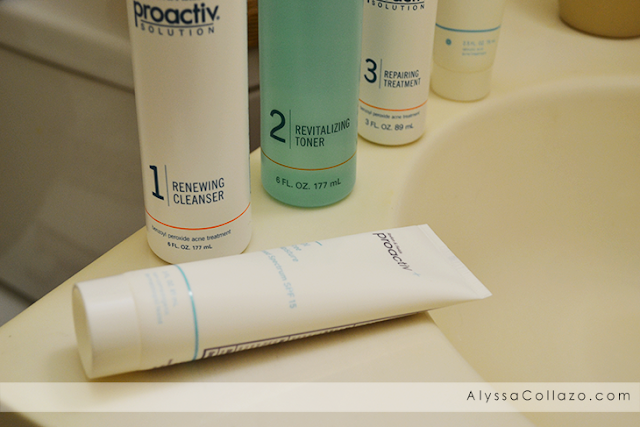 I fall in love with Proactiv's 3-Step System every time I use it. Plus, I really look forward to washing my face every night because of how refreshing it leaves me feeling and how clean my face is. My biggest area of blemishes and well, zits is my chin. Which is also the most sensitive part of my face. Wearing makeup to cover it up became part of my daily routine. I'm talking concealer, CC cream and bronzer. All of that, just to cover up my zits. And guess what? It never really worked. My skin would just break out more and more. Now that I use Proactiv. I do 3 much more simpler steps, that actually help my skin. I start with Step 1 the Renewing Cleanser, Step 2 the Revitalizing Toner and finish with Step 3 the Repairing Treatment, which is my favorite step. I try and keep this routine daily but often skip Step 3 and replace it with their Oil Free Moisture. I noticed a difference the next day, my blemishes and zits got smaller and I wasn't breaking out anymore! The hardest part for me during my Proactiv journey was realizing I no longer needed tons of makeup. I had nothing to cover up. I went from using so much, to so little. I literally apply eyeliner and lipstick and I'm okay! 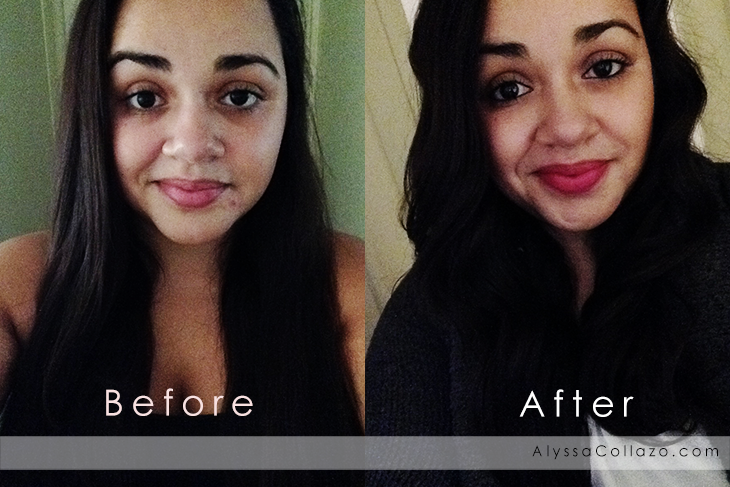 I threw out all that makeup and replaced it with a 3-Step System that makes me feel so confident and you can tell. My skin is less red and I have less blemishes. A bigger smile and I beam with pride. It's all thanks to Proactiv. 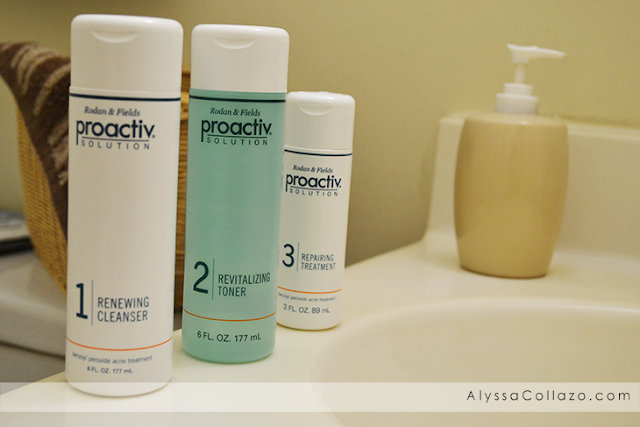 I plan on continuing to use my Proactiv 3-Step System daily, even when I don't have breakouts. It's like I'm giving myself a reward every night. To learn more about Proactiv or to try the products for yourself, visit Proactiv.com. Have you ever tried Proactiv, or wanted to? What are your thoughts about the products? I have acne prone skin and it drives me nuts but its is hormonal acne so unfortunately it won't go away anytime soon but I do look for programs that helps maintain my skin. I tried Proactiv years ago and it didn't work well for me but I think I will give it another chance. Thanks for sharing your review! I have been curious about Proactiv for quite awhile. The problem I have with it are the ingredients. However, I do recognize that in order to tackle bad acne you need some really tough chemicals in there. I do wonder though if the skin will be dependent on this and once you stop using Proactiv the acne will come back. Your Proactiv journey seems to be doing well. I have a friend who is also using Proactiv products and she really likes them. I am thinking of switching to Proactiv as my current beauty product is not that effective. The fact that you are using less makeup for your face since starting your Proactiv treatments says a lot about how well it's working for you. I think your face is beautiful and looks so refreshed, hydrated, and clean! Proactiv has been around for a long time and that is because it helps so many people of all ages. Good for you for trying it out too. My brother used this in high school for a while and had good results. I have acne now and again, but not something to warrant this kind of treatment. I've heard good things though! Looks like you had great results! I used Proactive for a while as a Teen and had great results. You have beautiful skin! I used to love using Proactive. My skin is now more mature so I have to use different cleanser, but I loved it when I used it. You look great! I love that you had a great experience with Proactiv! I have always wanted my husband to try it. Perhaps I will show him your review and see what he says! Thank you for posting this. Glad it worked out for you! Thankfully, I haven't had much trouble with my skin since I left my teens, but I sure could have used something like this. It sounds like a good system with a nice, refreshing feel.